Luma Key (Layer Mask): Adjusts the alpha channel based on the brightness level of pixels. Can use an optional external stream to provide values and includes controls for adjusting the brightness / contrast of the masking image before it is applied. Chroma Key (Chroma Mask): Adjusts the alpha channel based on how similar the pixel color is to a specified masking color. Shape Mask: Masks the image using patterns made from basic shapes such as triangles, rectangles, circles, diamonds. The Layer Mask FX in particular is extremely powerful because it can use a secondary layer as its input. This makes it possible to change the mask between source material, such as still images, movies, live cameras and video generators, as well as apply custom FX to the mask before it is applied. As all of these FX themselves are written in GLSL in the ISF specification, they can also be easily remixed or used as starting points for creating new masking FX that adjust alpha channels based on different parameters. 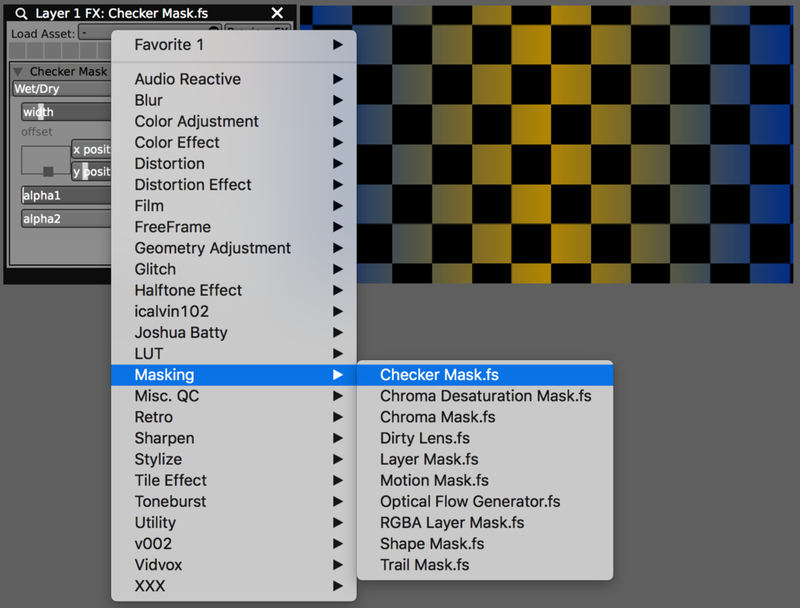 In this tutorial we’ll look at creating two custom masks: Checker Mask and Random Squares Mask. We’ll start by using the ISF Editor to create a new shader and saving it. Next, since this is very similar to the Checkerboard.fs generator, we can use that as a starting point – the code portion from this can be copied and pasted into the Checker Mask.fs, along with some of the input variables. Only a few basic modifications to the code are needed. Here instead of using colors for the different sections of the pattern we’ll include sliders that map to the amount of alpha adjustment. The color information will come from an input of type ‘Image’ which is called ‘inputImage’ to match the FX protocol. Finally, make sure to set the category of the composition to Masking so that it is included with the other similar FX. Once the FX is completed we can use it in VDMX; it shows up in the list under the Masking category and each of the parameters appears as the appropriate UI element that can be automated with control plugins or sync’d to MIDI / OSC / DMX inputs. For the next masking example we will begin is very much the same way. 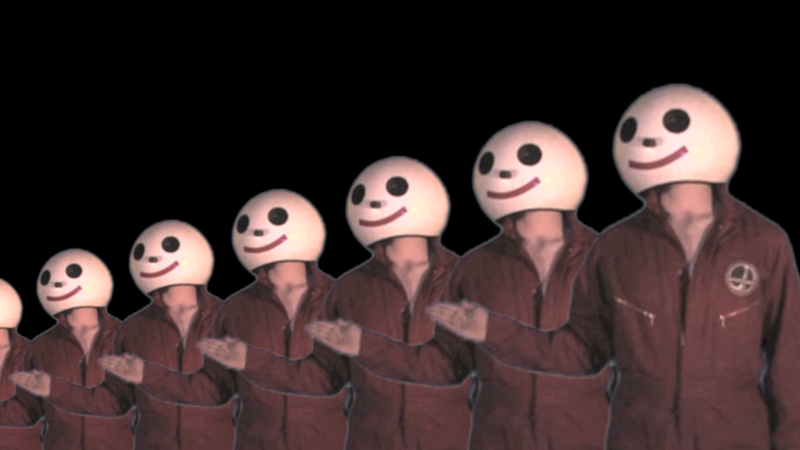 Our new FX is very similar to the Checker Mask we just created and it can be used as the starting point here. The main difference is that we will adjust the logic behind deciding which sections are masked and which are not by using some randomization. Random value generator functions are not built into GLSL, but we can find an example of a fast pseudo-random function in the Noise.fs example that can be copied and pasted into our new FX. Other types of noise functions can be found in other shaders if you’d prefer to use those instead. Pseudo-random functions are useful here because we can get a unique output by providing the same seed value to the function. This makes it possible for a grouping of pixels that have different coordinates to access the same randomized number. When including randomized values in shaders there are often two useful parameters to include for them that can be adjusted during live performance: (1) Random Seed (for changing the randomize pattern) and (2) Threshold (for controlling how much of the image is masked). Here instead of using the checker pattern we will determine the index coordinates of square that contains each pixel, and use that as to generate a pseudo-random value; this value will be the same for every pixel in the same region. If this number is above our threshold, we apply our mask, otherwise, we leave the pixel alone. Additive: Adds the new alpha to the existing alpha value of the incoming pixel. Multiply: Multiplies the new alpha with the existing alpha of the incoming pixel. Replace: Overwrites the existing alpha of the incoming pixel. Show Alpha: Useful for creating images that can be used as luma keys, this option sets the RGB of the pixel to the alpha level. Examples of how these three different modes can be set up can be found in the Layer Mask, Chroma Mask and Basic Shape Mask FX mentioned above. Another useful input parameter here can be an option to invert the behavior of the mask before it is applied. The OSCQuery Protocol is an extension to the OSC specification designed to make setup of communication between applications easier. 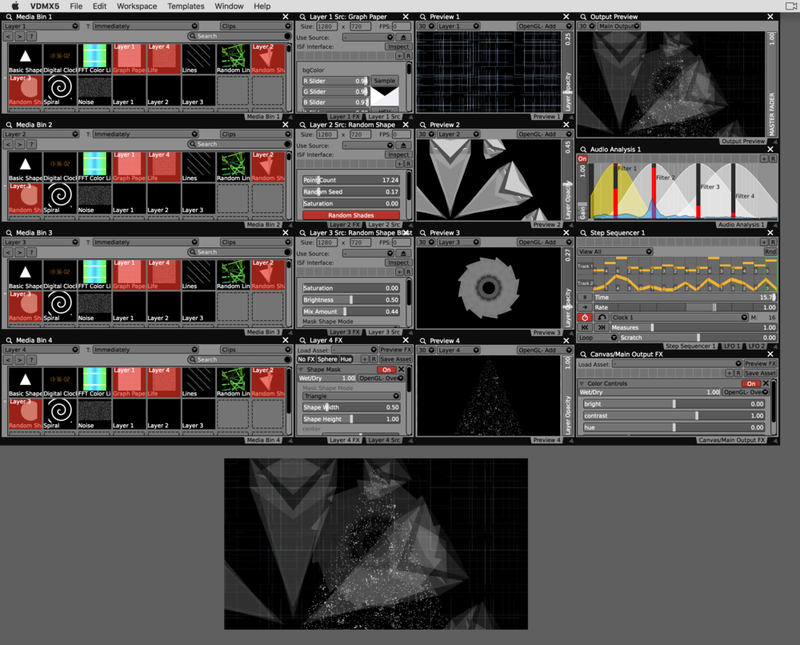 Within VDMX this new protocol can be used in severals ways that we'll be covering in this tutorial. You can also read more about OSCQuery in the blog post announcing its official release. The Control Surface is one of the most widely versatile plugins in VDMX, making it possible to create sets of custom interface elements that can be used to control nearly any aspect of your workspace or send MIDI / OSC / DMX to other systems. The Control Surface plugin also has the ability to publish its list of parameters over a local area network using the OSCQuery protocol so that other software can remotely browse and control almost any aspect of your VDMX project. In this video tutorial we'll be looking at the basics of using OSCQuery protocol from within the Control Surface, and three ways that those parameters can be accessed from software running on other devices: using our free OSCQuery Browser utility, another copy of VDMX and a web browser running on an iPhone. Along with the basic controls of inverting values and applying basic math equations, number FX chains can used to adjust the values of data-sources before they are applied to sliders. In this example the 'Fall' FX will be applied to an audio analysis level to create a falling style before being applied to a VU meter generator. When writing GLSL shaders that run as generators or are used as image filters, one of the most fun parts of the process is playing with different control functions to animate all of the various variables that you've created in the composition. Using the ISF specification, GLSL shaders can publish their uniform variables so that host applications can provide user interface controls that can be connected to MIDI, OSC, DMX or other data-sources for automation. In this tutorial we will look at adapting an existing GLSL shader into ISF, publishing some of its variables as uniforms, and loading the composition into VDMX where we will animate its properties using a variety of different plugins and MIDI input. While VDMX offers many ways to extend its capabilities with code by Quartz Composer, Vuo and writing your own custom interactive GLSL shaders, there are times when you may need to use a video generator, image processor, or data controller that for whatever reason require using another most extensive programming toolkit for some aspect of your live performance. One of the most popular creative coding languages being used today is known as Processing, a free, open-source development environment with an extensive community of artists and technologists around the world. You can look online to find hundreds of examples and they provided wonderful educational materials to help you get started with learning how to write code to make art. Just as the many array of cosmological possibilities open up when pondering the vastness of the universe, so equally are the nearly infinite outputs when working with FX in VDMX. In this tutorial, Colin Evoy Sebestyen will explore creating a “Stargate” style effect. From Jupiter to beyond, get ready to traverse time and space! The heart of almost every VJ / Visualist performance is the loop. There are lots of techniques and training for the production of loops, but there are some common approaches and methodology of creating a “pack” that are explored in this guest tutorial by Colin Evoy Sebestyen. To demonstrate these ideas Colin breaks down a project he created with musician Nonagon for a performance series at The Tech Museum of Innovation in San Jose. Creating the right look for Halloween and other spooky themed events is one of those tricks that every visual artists needs to have in their go to bag of tricks. There are lots of different techniques that can be used and in this guest tutorial we are joined once again by Colin Evoy Sebestyen for a demonstration of how to use a combination of LUT based FX, real-time video generators and logo images to create a retro horror film graphic scene in VDMX. In particular this look is inspired by intro sequences like the one from The Gate and more recently Stranger Things.